KGI Securities analyst Ming-Chi Kuo, who has a very good track record in predicting Apple's product plans, has issued a new research report outlining his expectations for Apple's 2013 product launches. Kuo believes that Apple will focus its launches on the third quarter of this year, with a number of updates throughout the company's various product families. - iPhone: Kuo expects that Apple will introduce both an iPhone 5S and a revamped iPhone 5 around June or July of this year, with the iPhone 5S appearing very similar to the current iPhone 5 but carrying a number of upgrades including an A7 system-on-a-chip for better performance, a fingerprint sensor, and camera improvements such as an f2.0 aperture and a smart LED flash. He also believes that the lower-cost iPhone will in many ways simply be an iPhone 5 repackaged into a slightly thicker (8.2 mm vs. the current 7.6 mm) plastic enclosure available in six colors. - iPad and iPad mini: Kuo forecasts that Apple will update both lines during the third quarter of the year, with the iPad mini gaining a Retina display as the most notable change. He also predicts that the full-size iPad will become considerably slimmer and lighter and adopt the thinner side bezels seen on the iPad mini. - MacBook Pro: In line with his predictions from last year, Kuo believes that Apple will do away with the non-Retina MacBook Pro line in 2013, moving to an all-Retina lineup at cheaper price points than the current Retina models. Kuo also believes that Apple will tweak the design of these thinner Retina MacBook Pros, despite having just introduced the current form factor last year. - MacBook Air: Retina displays remain a challenge for the MacBook Air given their relative thickness, and Kuo predicts that they will not be appearing in the 2013 MacBook Air lineup. Kuo believes that a move to Intel's forthcoming Haswell platform will be the main upgrade for the machines, with the update coming perhaps as soon as late in the second quarter. - Desktops: Kuo notes that the iMac redesign has been well-received, but it appears that he does not see Retina displays coming to the lineup in 2013. He simply predicts a shift to the Haswell platform for the iMac and Mac mini in the fourth quarter of the year. Kuo's report does not address a new Mac Pro, even though Apple CEO Tim Cook had personally shared that a significant update for the line was due in 2013. - iPod touch: Apple will reportedly discontinue the fourth-generation iPod touch, which is currently being sold alongside the new fifth-generation models. In order to fill the gap, Kuo believes that Apple will introduce a scaled-back fifth-generation model with 8 GB of storage and no rear camera at $199. - Apple TV: Kuo predicts a minor update to the existing Apple TV product as soon as late this quarter, but he offers no details on what the update would entail. He also notes that Apple's more substantial television effort is unlikely to appear in 2013, with content issues and a lack of experience in the television set industry pushing things back until 2014. Apple will launch new phones, tablets, and notebooks in 2013. As you can see by my statement above I am a highly respected analyst who put great thought into my prediction. If they don't upgrade the Mac Pro in 2013, I will be buying a desktop PC. I love Apple, but this is really getting insane. I have work to do, Apple, and I'm not upgrading to the current Mac Pro. Android Fanboy : Samsung is better at making Spaceshuttles. Apple Fanboy : I love retina, I dunno how you use 720 , honestly. Macrumors member : Hate everything that I buy, Buy Everything I hate. Me: Oh just quit B#@$$#@. Please stop posting anything from this guy. He has NEVER come out with a single original thing. Every of one his analyst/sources are AFTER numerous other blogs have put out things. He culls together numerous rumors and ignores the ridiculous/far fetched stuff. Iphone 5s? Cheaper model? really where have we heard these before. This guy is full of crap, all these predictions are either extremely safe or bizarrely out of touch. Apple is not going to release a different product as an "iPhone 5." The only iPhone 5 they will ever sell will be the one they are selling now. 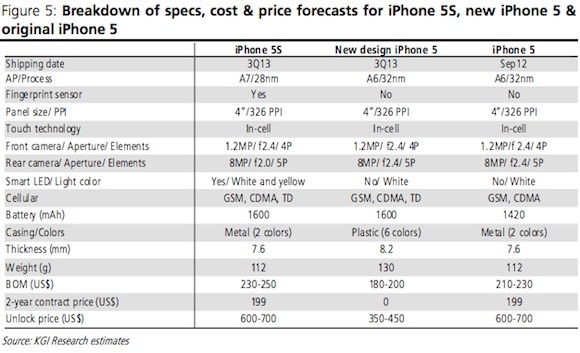 An iPhone 5S will likely have the same design, just like the 3GS and 4S matched their counterparts. And why would they announce two new phones in the same quarter but not at the same time? This isn't news. This isn't even educated guessing. iPod Classic refresh please (HDD increase). Nothing for the first 6 months of the year? No way. Investors are already feeling shaky and the stock is doing terrible. No product releases for 6 more months would be market suicide. I think we'll see the redesigned iPad, as well as the retina iPad mini sometime around March. I also think we'll see an iWatch released in the first 6 months. New iPhones in June. I guess cheap iPhones as well, but I have my doubts. I think we'll also see a redesigned Mac Pro in the first 6 months of the year. It would be nice if they released a new redesigned thunderbolt retina display to go with their pro machines. 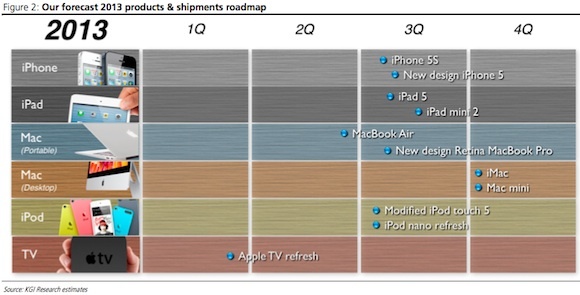 That of course would lead to retina iMacs towards the end of the year.